Motorbooks Publishing sent me this seven pound book to review. It retails for $60.00 and is a work of art. You’ll need a sturdy coffee table for this book! If your going to create a historical compilation of the most important motorcycle collection on earth than you should use the highest standards of photography and printing to do the collection justice. I think Randy Leffingwell, Darwin Holmstrom, Harley-Davidson and Motorbooks have done a fantastic job in creating a work of art. The quality of the paper, printing, photgraphy and of the course the collection itself is outstanding! I started reading each year one at a time but have not finished yet and didn’t want to wait any longer to tell you about this masterpiece. Each year has at least it’s own two page spread with photo’s, description, history and interesting statistics. Interesting statistics? Is there such thing? Well, it is interesting to note how many models of each motorcycle were manufactured and how much they sold for back in the early years. I know this book costs more than most, but if you’re an enthusiast you’ll like it! 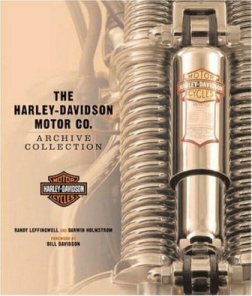 If you like coffee table books, you’ll also want The Great Book of Harley-Davidson which weighs two pounds more than the Archive Collection. Pound for pound this has to be the most motorcycle book for your buck compared to any other!